This is a set of high quality replacement Dyson DC27, and DC28 Bagless Upright Vacuum Cleaner Filter Kit. This convenient, time & money saving kit includes; (1) Dyson DC27 Washable Primary Dust Cup Filter, Generic for Dyson Part Number 919780-01, as well as (1) Dyson DC-27 and DC-28 Post Motor Washable HEPA Filter, which fits Dyson Part 915916-03. This filter kit includes both filters for both the Dyson 27, and Dyson 28 Animal models, and both filter are washable, and reusable. The HEPA Cartridge filter is best cleaned by using an air compressor, however it may be rinsed off. It's important that both filters be 100% Air Dried before reusing however. Many users always like to have a clean, dry set of replacement filters for their Dyson on hand, to rotate in their DC28 Animal, or DC27 Models. These are generic aftermarket filters designed to work with Dyson DC27 models; Dyson DC27 Total Clean, and DC27 HSN Exclusive, DC-28 Animal Bagless Uprights. 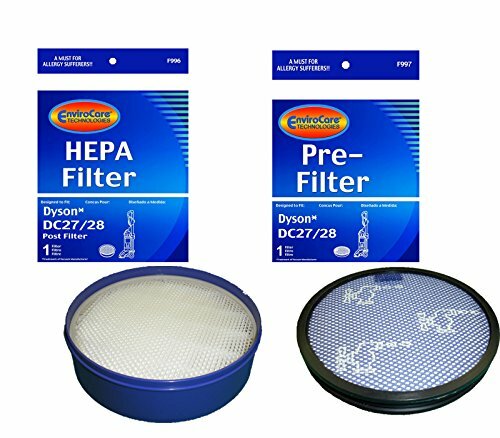 Works With Dyson Parts (Washable Blue Filter) 919780-01, 91978001, and (Post Motor HEPA Exhaust Filter) Part 915916-03.